» POPEYE® PREPARES TO CELEBRATE 90 IN 2019! Popeye > News > Entertainment > POPEYE® PREPARES TO CELEBRATE 90 IN 2019! As announced in May, King Features and entertainment studio WildBrain will produce the first original Popeye content in over 10 Years! These all-new shorts in the popular squash and stretch animation style will debut this Fall. audience across the platform. 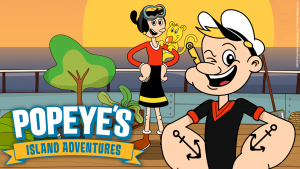 The digital studio recently unveiled new compilations of cartoon favorites including Classic Popeye, Popeye and Son, and The Continuing Adventures of Popeye. In Popeye’s early days, E.C. Segar often shared artwork drawn by fans at the end of the Thimble Theater comic strip. He called this “Popeye’s Cartoon Club,” and it gave ordinary readers a chance to share the page with Popeye. In honor of Popeye’s 90th birthday, King Features is bringing Popeye’s Cartoon Club back with a special twist. This time, Popeye is inviting cartoonists from around the world to contribute their own comic strip featuring the spinach-loving sailor and his friends; these new original strips will be published weekly throughout 2019. Healthy Lifestyle: Popeye continues to stand for strength and fitness. Now GameFood Company will make Popeye vitamins and protein bars available in Russia and Popeye nutritional supplements are being developed by Brasterapica Industria Farmaceutica in Brazil. Apparel: Expect to see new clothing lines from HUF and Giordano, C-A-P Co, Aurimoda and Hanes. And an exciting new footwear collaboration with NotLikeYou, who will bring unique Popeye designs to custom Converse Chucks and Timberland Boots in Germany.